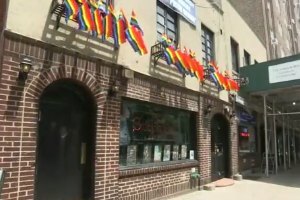 The Stonewall Inn on Tuesday was made a New York City landmark, marking the first time a site has been named based primarily on its significance to the LGBT community. The city's Landmarks Preservation Commission voted unanimously for the status after holding a public hearing. Historians often credit the June 28, 1969 police raid of the Stonewall Inn in Greenwich Village as a major flashpoint for the gay rights movement. While such raids at the time were common at gay bars, patrons on this night, many of whom were drag queens, resisted arrest. Councilman Corey Johnson, whose district includes the Stonewall, was among the supporters who spoke at the hearing. The Stonewall Inn was placed on the National Register of Historic Places in 1999 and is part of the Greenwich Village Historic District, a city designation. But Andrew Berman of the Greenwich Village Society for Historic Preservation told the AP that those designations weren't enough to fully protect the two adjoining buildings. “Under the existing state and national designations and even under the New York City historic district designation, the building could still be altered or even torn down. This says that it is a place of unique significance and it will help ensure that it survives for generations to come,” he said.